The entire population of Eatonville gathered for this picture when it was taken — around 1890. A settlement of a few buildings grouped together behind a rail fence in a clearing was called Van Eaton’s Trading Post around 1890. The “surrey with the fring on tope” owned by T.C. Van Eaton, was used a a stage to and from Spanaway and on the trip this way would carry food, passengers and mail, going all the way to Longmire, which was corduroy road most of the way. 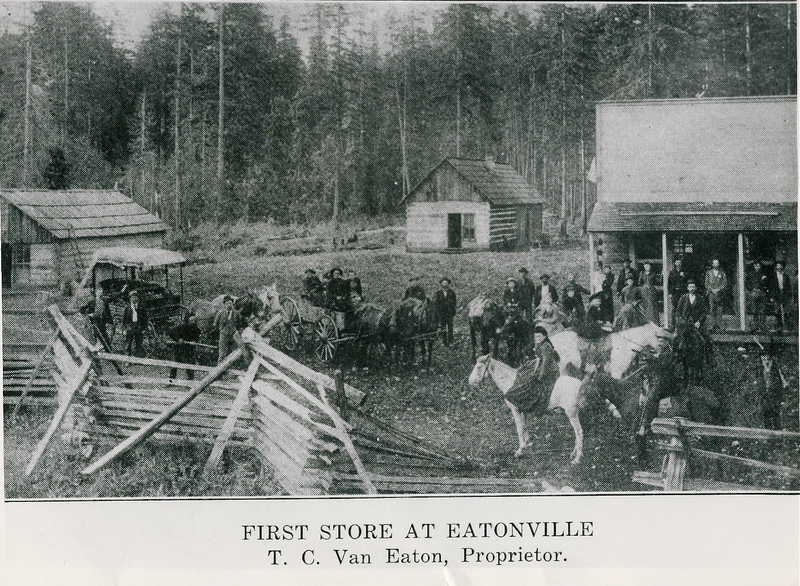 On horseback, directly in front of the trading post, Eatonville’s first store, are Mr. and Mrs. T.C. Van Eaton and Mrs. Groe. Sitting in the wagon are Mr. and Mrs. Richard Canty and Mr. and Mrs. Richard White, the teller of tall tales and one of the most colorful characters to come to Eatonville, is at the left. 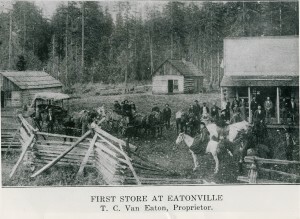 The Van Eaton log cabin at the rear, now part of the Eatonville Hotel, and the trading post, in a different location, on upper Mashell Avenue, are both still in use. The latter is used by Williams’ Electric.